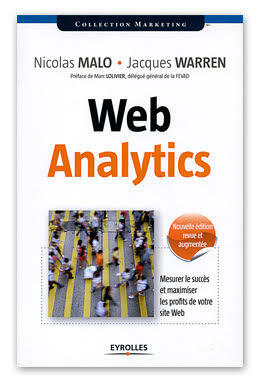 The second edition of the book, “Web Analytics : mesurer le succès et maximiser les profits de votre site Web”—co-authored by Jacques Warren and Nicolas Malo—was published on 30 August, 2012. This new, revised edition is some thirty pages longer than the first, and includes testimonials from some twenty marketing and e-commerce managers and Web Analytics specialists. It has also been updated with new content, including a section dedicated to social networks, which have come to represent a significant part of the Web experience since the first edition was published in 2009. Written first and foremost with decision-makers and marketing teams in mind, “Web Analytics” requires no prior knowledge of Web Analytics tools, nor any specific technical skills. As the reader progresses through its pages, he will gain a thorough insight into the fundamentals required to measure, analyse, and optimize the performance of on-line businesses. The first edition was well received by readers, the media and professional bloggers alike (http://www.webanalyticsprofits.com/fr/temoignages.html). A must-read for all marketing and e-commerce teams!